Cardinal Scale Admiral Series features quality, extremely heavy-duty platform, flow-through column design to eliminate water and material buildup, paired with the 190 Storm indicator, extreme temperature & water-pressure resistance, serial port, ColorZone checkweighing, & power options. 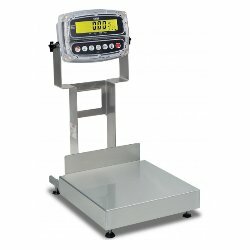 The Cardinal Scale Admiral series CA-190 bench scale is designed for speed and accuracy with an extremely heavy-duty platform that provides a stable base for high-usage food processing applications. Built with the operator in mind for ease of use, the scale column’s flow-through design also eliminates material and water collecting in crucial areas, maintaining a more sanitary environment. 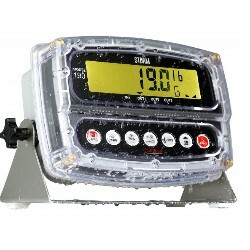 Combined with the extreme-duty 190 Storm indicator, capacitive touch keys, 1-inch/25 mm high clearly visible LCD digits, built-in RS232 communications port, ColorZone checkweighing, and versatile power options, this bench scale is unmatched. The bright, vivid ColorZONE display changes color automatically as pre-assigned target weights are reached for efficient check weighing.